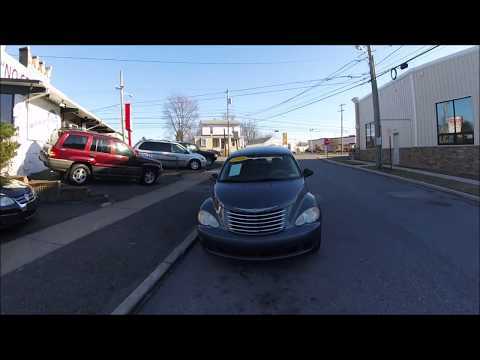 06 Chrysler PT Cruiser: Only 93k miles, new PA Inspection, CD Player, Power Locks and Windows, RUNS EXCELLENT! This vehicle comes inspected and has been given a bumper to bumper safety check. It is very clean, reliable, and well maintained. We offer a unique pay plan that is known for being the easiest and fastest financing option in the PA area. To get this car, you put $1200 down then pay either $80 a week or $160 bi-weekly on a balance of $4700, which you will typically pay off in a little under two years. It’s that simple. We call it BUY HERE PAY HERE, so no banks, no finance companies, and most important, no credit checks. This program is available to everybody. There is a reason we have been here for over 30 years. While most dealerships buy their cars from auctions, we only buy from new car dealerships so they run better, and last longer. Every car comes with a free warranty and we have multiple warranty programs that provide the best coverage to our customers. All you need to drive off is a license, insurance, your down payment (Cash, Money Order or Credit-Debit Card), and proof of income (paystubs, SSI letter or check, etc.). Everybody is guaranteed to drive off and we have tons of beautiful vehicles waiting for a buyer, so stop in today! Car & Van World | Used BHPH Cars Prospect Park | Bad Credit Car Loan Specialists has been visited 7,941,291 times.